Dell’s $67 billion deal for computer-storage maker EMC is running into trouble. For one thing, EMC’s market value has slumped. For another, the numbers are suggesting either that the deal is in jeopardy, or that the VMware tracking stock that EMC shareholders will receive is worthless. EMC’s $21 billion virtualization-software subsidiary VMware, which is separately listed and due to report fourth-quarter earnings on Tuesday, has lost around 40 percent of its market capitalization since the Dell-led buyout was unveiled in October. That means the Dell consortium’s offer for EMC is now worth less than $60 billion. Meanwhile the shares of EMC, itself scheduled to report on Wednesday, have given back almost all of what they gained with the deal news. The so-called arbitrage spread has widened – at roughly $50 billion, EMC is now worth barely more than 80 percent of the current value of the buyout. The headline deal price is unreliable, though, because in calculating it the companies assumed the new VMware shadow stock will be worth the same as the company’s actual shares. Under that assumption, the implied odds of the merger happening have plunged close to zero. If that seems improbably low, another way to cut the numbers is to assume the transaction will definitely happen as agreed. Because EMC shares are trading barely above the cash component of the deal, that would suggest the shadow VMware stock will be worth almost nothing. That would call into question the whole tracking-stock concept. The real story is probably somewhere in between. Investors may also have broad concerns about financial-market volatility – and specific fears of a price renegotiation driven by deteriorating debt markets. Financing is supposed to be a risk taken by Dell and its partners and they might have to pay EMC as much as $6 billion if they walk away from the deal. But Carlyle last week negotiated a lower price than originally agreed for Symantec’s Veritas unit under similar circumstances. The target’s business had deteriorated, too – but so has EMC’s, at least at VMware if the share-price slump is any indication. 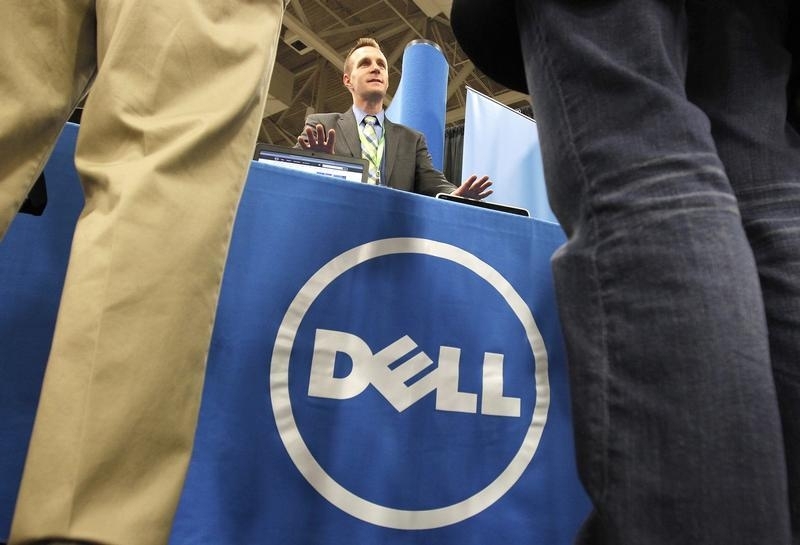 Decent earnings from VMware and EMC could help keep Dell’s deal on track. If it starts to crumble, though, it will be a reminder that reaching too far in both scale and complexity can be risky in M&A. Virtualization-software producer VMware is due to report fourth-quarter earnings after U.S. markets close on Jan. 26. Computer storage maker EMC is set to report on Jan. 27. A consortium of PC maker Dell, its owner Michael Dell, MSD Partners, Silver Lake and Temasek on Oct. 12 said it had agreed to buy computer-storage maker EMC in a $67 billion deal. EMC shareholders will receive $24.05 in cash and approximately 0.111 shares of new tracking stock in VMware for each share of EMC. VMware is a separately listed company in which EMC owns an approximately 80 percent interest. The initial deal valuation, $33.15 per EMC share, assumed the VMware tracking stock is valued at $81.78. At around noon EST on Jan. 26, EMC stock was trading at $24.22 and VMware shares at $48.32.